The President's Outstanding Service Award honors members who have contributed an extraordinary effort on behalf of NAMA during the previous year. 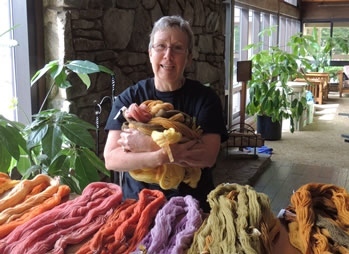 The 2015 President's Outstanding Service Award is given to Susan Hopkins, Cheryl Dawson, Dorothy Smullen, and Dorothy Beebee for their extraordinary effort to create a new section, Mushroom Dyes & Papermaking, on the NAMA website. The committee spent countless hours gathering information and images, and putting it into an easy to understand, comprehensive format. Job well done. Thank you. The Outstanding Service Award is given this year to Connie Durnan, in recognition of her role in organizing NAMA’s participation at the 2014 Science & Engineering Festival in Washington, DC. Connie devoted many hours to organize the booth, enlist volunteers and gather materials to ensure that our display would attract visitors. Connie made repeated trips to FedEx, hosted the author of The Fungus Files in her home, and coordinated with other participants from her club, The Mycological Association of Washington DC. Through her involvement, the STEM event gave NAMA national visibility, provided educational outreach and set the stage for similar activities in the future. Connie has served several roles in NAMA, including Club Trustee, and member of the Executive Committee. Adele Mehta received the President’s Outstanding Service Award in recognition of her many years as Second Vice President and as Foray Recorder. She has also headed up an important Ad Hoc Committee and has taken on many additional tasks at the request of the President. As Foray Recorder, she has played an essential role in getting the information about each species found on Annual Forays into the database housed at the Chicago Field Museum. While the rest of us who attended Annual Forays were enjoying ourselves in the field or attending lectures, she could be found in the display room attending to her exacting duties, often working late into the evening. NAMA is indeed fortunate to have such a devoted member. Linnea Gillman received the President’s Outstanding Service Award in recognition of her years of work as Secretary as well as her many accomplishments as Chair of the 2010 Annual Foray. Her work as Secretary has been exceptional. The marathon Trustee meetings often last for countless hours and at times it is extremely difficult to keep track of the many comments and motions offered by the participants. She met and overcame the daunting challenge of keeping accurate records and then later preparing written versions of everything that happened at those meetings. In addition to her secretarial duties, Linnea acted as Chair for the 50th Anniversary Celebration of the Annual NAMA Foray. Hosted by the Colorado Mycological Society, this Foray was an extraordinary tribute to our club and its many talented and dedicated members. It was a hugely successful event, due in large measure to the efforts of Linnea. 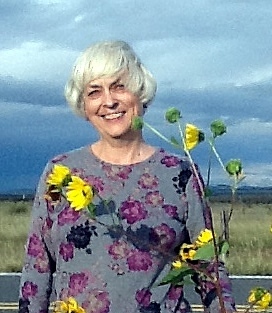 Dianna Smith received the President’s Outstanding Service Award in recognition for her terrific work as Editor of The Mycophile. She took on this demanding position in December, 2011. Before Dianna became Editor, the Mycophile was a spotty publication at best with seemingly insurmountable delivery problems. Although this was not the fault of her predecessor, it was a predicament that demanded a quick and decisive solution. But happily, the first issue published under Dianna’s leadership was a delightful surprise and put all my concerns about the publication aside. It was full of colorful photos and interesting articles. As a result of her resolve and willingness to put the time in to improve this publication, we now have an eminently readable and enjoyable newsletter—delivered in a timely fashion—that we can all be proud of. Thanks Dianna, for being willing to take on this very demanding and important position. This year the President's Outstanding Service Award was given to two NAMA members: Dr. Patrick Leacock and Ike Forester. This award is presented to Dr. Patrick Leacock in recognition of his many years of dedicated and outstanding service to NAMA. Beginning in 1988 he served as Recorder for many years and, in 1997 assisted in instituting the NAMA Voucher Collection Program, serving as Chair of the Committee, Coordinator of the Program, and liaison with the Field Museum since 1998. Dr. Leacock has not only directed, but has also provided professional assistance with the identification, photography, preservation, and accessioning of hundreds of NAMA voucher specimens. He has carefully compiled and analyzed data from the voucher collection as well as prior years of foray lists. Through Dr. Leacock’s exceptional efforts and leadership, NAMA has built and maintains one of the finest collections of fungi in North America. This award is presented to Ike Forester in recognition of his outstanding and dedicated service to the North American Mycological Association. Ike held the position of Treasurer for several years followed by two terms as President, both important and demanding positions that he handled with distinction and foresight. As President he successfully guided this organization with skill through unexpected and challenging circumstances. In addition, he has generously given to NAMA the benefit of his professional expertise and advice. And most importantly, he was able to maintain NAMA’s tradition of excellence and to pass on to the new management team an organization in shipshape. This year the “President’s Outstanding Service Award” was given to two well deserving NAMA members; one to Judith McCandless and the other posthumously to the late Kit Scates–Barnhart. In recognition of her many years of dedicated and exceptional service to NAMA as Treasurer and her earlier service as Frist Vice President and Region IV Trustee. NAMA is indeed fortunate to have her in a leadership position. Judith can always be depended upon to assist in any and all NAMA projects and represents an ideal role model for other members to emulate. Kit Scates-Barnhart is being recognized for her many years of dedicated service to NAMA in a variety of roles including chair of the Education Committee where she began the slide-tape educational program and got Rolf Singer and Alex Smith to prepare a tape on mushroom pronunciation; work on the toxicology committee where she prepared a toxicology poster for doctors and hospitals; her photography workshops and mushroom educational workshops at NAMA forays; her service for several terms as NAMA First and Second Vice President and as Regional Trustee; and for her inspiration in creating both the North Idaho Mycological Association and the Pacific Northwest Key Council and mentoring of their members. The year’s President’s Award was given to David Rust, NAMA webmaster, for his work on the NAMA website. In addition to the amount of time David devoted to the website, he also worked closely with the committee chairs to update information, he assisted in the creation of a NAMA Speakers Bureau, and helped keep NAMA members informed of our work. The new website design has attracted many new visitors, and incorporates NAMA's standard color scheme. David is co-founder of the Bay Area Mycological Society. He created the All California Club Forays in 2005 and coordinated the Mycoblitz science forays at Point Reyes National Seashore from 2005-2007. He is an active participant in the Yosemite Fungal Survey. He is past president, vice president and fair committee chair of the Mycological Society of San Francisco. For over a decade, David has followed news and research about the devastating forest pathogen Phytophthora ramorum, which causes the disease known as Sudden Oak Death. David is a participant in the North American Mycoflora Project, a new citizen science endeavor to document all fungi on the continent. 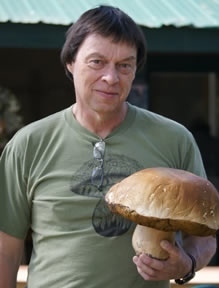 He has given talks to mycological societies in California and Oregon and is a regular speaker at the Point Reyes National Seashore Fungus Fairs. This year’s recipient of the Harry and Elsie Knighton Service Award has served in just about every capacity his club has to offer. He is the Chairman of the club’s annual fall mushroom show. He leads introductory mushroom forays for beginners. He is also an expert mushroom identifier for the club at its shows, forays and meetings. 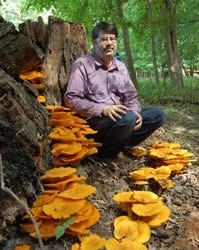 He has spearheaded a study to identify and catalogue all the fungi of a local forest preserve. He co-founded the club’s mushroom cultivation group, which has successfully grown more than a dozen different kinds of mushrooms. He has been especially successful in club out-reach activities, attracting many new members for the club. He has also worked with school children teaching them how to cultivate mushrooms and cultivating in them an interest in fungi that may bring some of them into the club as members someday. 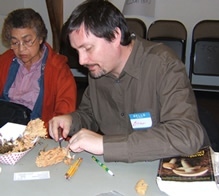 The recipient of the 2008 NAMA Harry and Elsie Knighton Service Award is Brian McNett of the Kitsap Peninsula Mycological Society. The President's Award for 2007 was presented to Carlene Skeffington. Carlene has served in numerous capacities for NAMA for over 20 years, including Treasurer, Regional Trustee, and Executive Committee. 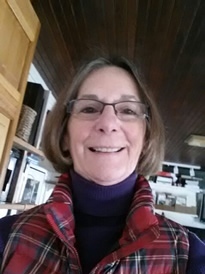 She has been a member of Dyeing & Paper Making Committee, Education Committee, Foray Committee, Mycophagy Committee and curator of NAMA's education programs including all slide and tape programs. She has always volunteered to help in every aspect of NAMA whether through leadership roles right down to cleaning mushrooms for the mycophagy sessions. Carlene's willingness to serve is truly the stuff which has made NAMA the successful organization that it is.